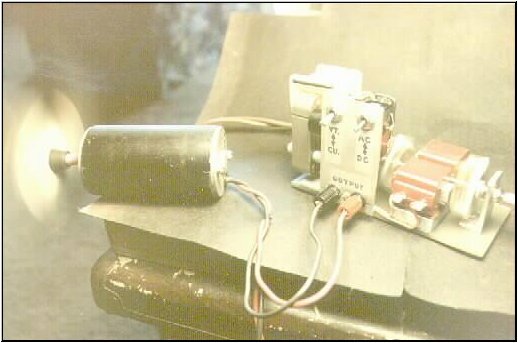 This is a picture of the first G-Field test unit that I built the efficiency was 120%. 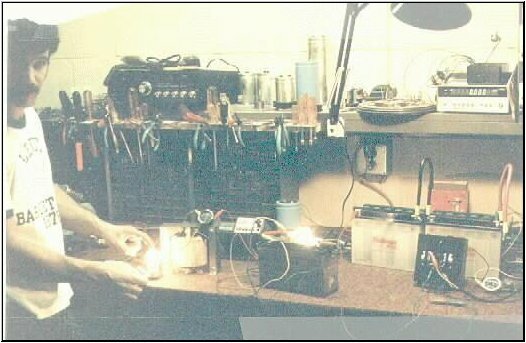 This is a picture of John Bedini testing a three battery Tesla Switch. The lights are 120 watt quartz lamp and a 100 watt 115 v house lamp. 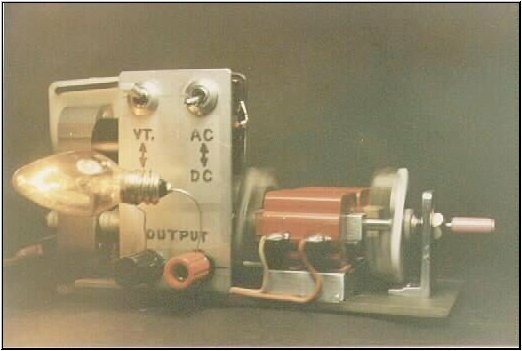 This is a picture of the Tesla Switch and the "HIGH VOLTAGE" that appears across the output. 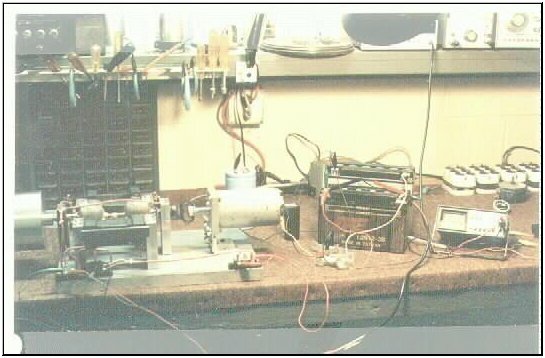 This is a picture of a small model G-Field that Ron Cole made to test the efficiency. 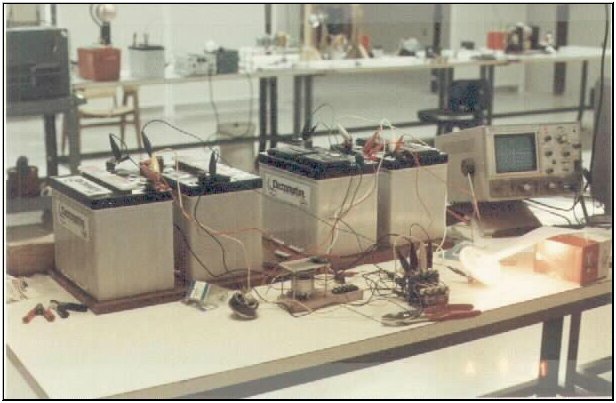 The test were performed by Ron Cole On two G-Field Generators. 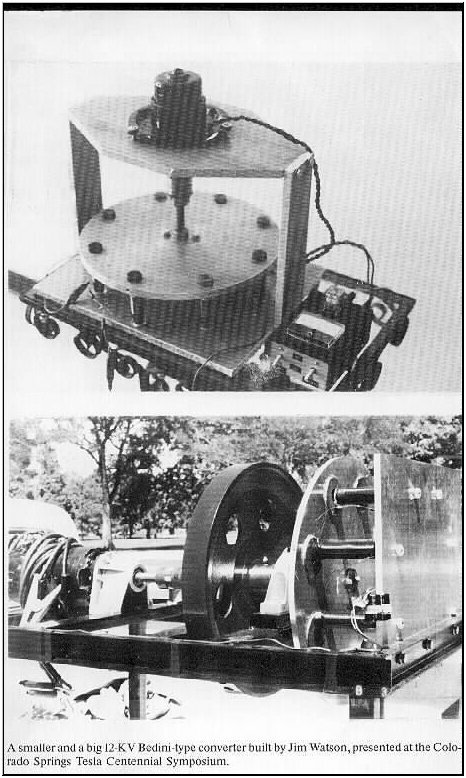 The above test results were obtained from a small kromrey generator, built by John Bedini in 1983. The test was conducted by Tom Bearden, and John Bedini in late 1983: Later they were reconfirmed by Dr. Patrick Flanagan. The test were conducted in a manor as to prove the converters most basic concept; (Input Power) versus (Output Power) into a usable load. The connection to replace used energy to the battery as a self charging action was not in place, so as to prevent any confusing reflex factors. All of the above reconfirmed by, Ron Cole, on the evening of 11-9-1984. 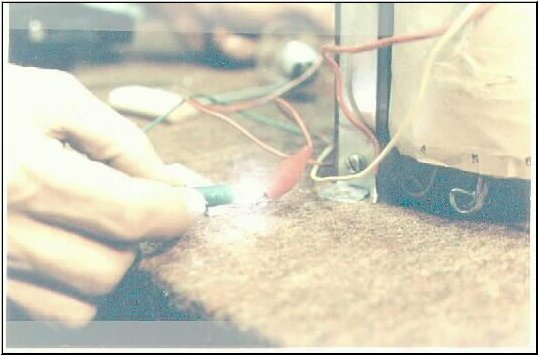 We also obtained results that far exceeded the results shown above, when the battery self charging circuit was connected. Small 1/2 AH, NiCad Batteries were used for input Source. 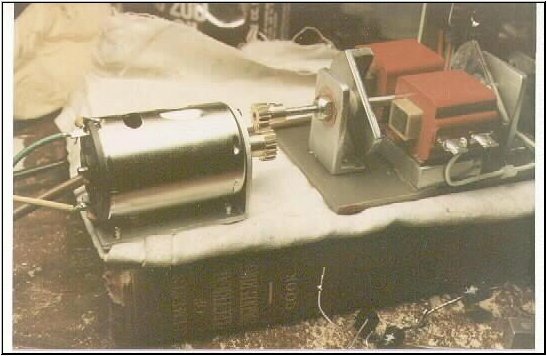 This is a picture of the final test unit Ron Cole made the G-Field generator is powering a 7.5 Watt load. James Watson, one of the more advanced of current experimenters, has built several demonstration machines, each with increasing performance. Each overcomes its own internal friction and recharges its own batteries. As of this writing, he is working on a solid state device. This writer will closely follow his progress and provide all possible encouragement. 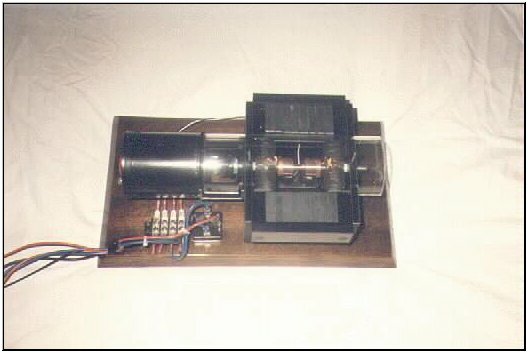 This is a picture of a small G-Field Generator built by Bedini Electronics 1984.